"The great book of nature," said Galileo, "can be read only by those who know the language in which it was written. And this language is mathematics." In The Language of Mathematics, award-winning author Keith Devlin reveals the vital role mathematics plays in our eternal quest to understand who we are and the world we live in. More than just the study of numbers, mathematics provides us with the eyes to recognize and describe the hidden patterns of life―patterns that exist in the physical, biological, and social worlds without, and the realm of ideas and thoughts within. Taking the reader on a wondrous journey through the invisible universe that surrounds us―a universe made visible by mathematics―Devlin shows us what keeps a jumbo jet in the air, explains how we can see and hear a football game on TV, allows us to predict the weather, the behavior of the stock market, and the outcome of elections. Microwave ovens, telephone cables, children's toys, pacemakers, automobiles, and computers―all operate on mathematical principles. Far from a dry and esoteric subject, mathematics is a rich and living part of our culture. 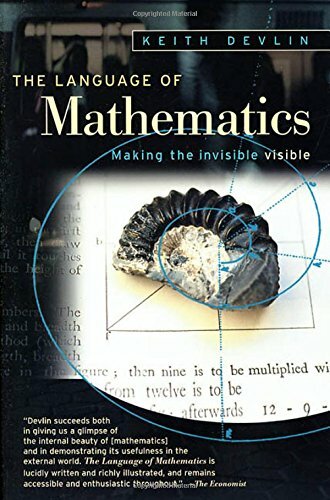 An exploration of an often woefully misunderstood subject, The Language of Mathematics celebrates the simplicity, the precision, the purity, and the elegance of mathematics. If you have any questions about this product by Holt Paperbacks, contact us by completing and submitting the form below. If you are looking for a specif part number, please include it with your message.